Emily's been doing some interesting things over the past week. She's been moving, every day or two, about a foot to the south. She doesn't take down her old web, she builds a new one right next to the old one, and attached to it. Right now she's got four orbs together (Like OOOo), and she's hunting in at least two of them. No idea why she's doing this. She's been catching and eating flies like gangbusters. Often I'll go out back to check on her and find her wrapping one fly while still eating another one. It's amazing how much her size changes after she's eaten, her opisthosoma can double in size from one day to the next if she's been particularly lucky. I've no idea how many flies she's actually eating since it doesn't take her long to dispatch with them -- it could be one a day, or it could be ten. But she's guarding my door, which is nice of her. Here she is hanging on to her web by two legs, (like she's doing a spidey pullup,) twirling a fly in four, and guiding silk from her spinnerettes with the back two. The whole thing is happening very fast, she's twirling that fly like it's a Rubik's cube and she knows the solution. 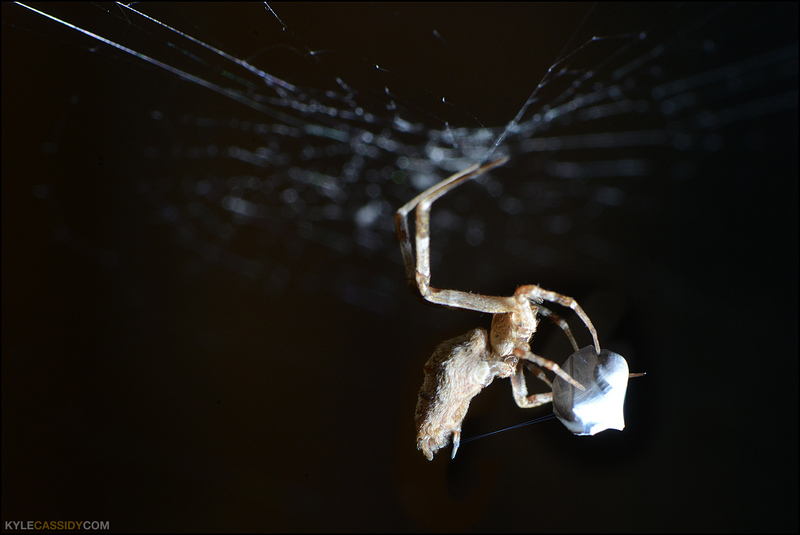 Hackled orb weavers like Emily use about 450 feet of silk to wrap and crush their prey. Emily wrapping a fly. You may clickenzee to embiggen! trillian_stars is out at 5 am kickboxing. How's your day? That is really cool, but I think I count 5 legs doing the wrapping. Is it possible for her to guide the silk using one (I keep wanting to say "hand") only? Thanks to you and Emily, we have been carefully observing a wee spider who has spun a web in the corner of our doorway. I will try and take a picture. I'm really enjoying these spider posts of yours. I love the way they demonstrate how much you can notice, how much you can learn, if you just pick something and pay very close attention to it. Doesn't have to be a spider, any kind of living thing will do--a plant, an insect, any of the sorts of things one might ordinarily overlook. The rewards of observation! Also interesting to read of at least some sympathy for the fly. That one leg sticking out the other side of the cocoon reminded me of a dwarf nose.